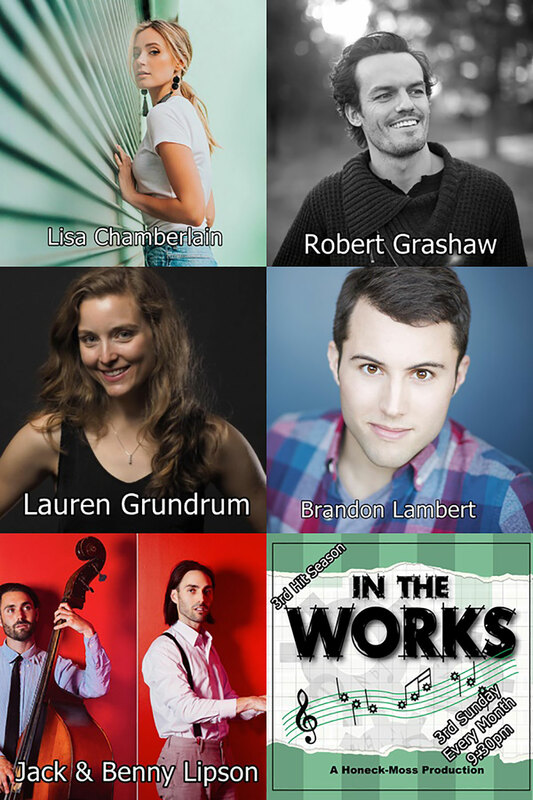 Honeck-Moss Productions is proud to present “In The Works.” This exciting new series was conceived as an opportunity for composers to try out new work in front of an audience and see how it plays in a supportive environment. It is also an opportunity to create community among the composers and their performers. In The Works will be presented monthly and feature four composers or composer teams, each presenting about 20 minutes of new material. This month features the works of composers: Lisa Chamberlain, Robert Grashaw, Lauren Grundrum & Brandon Lambert, and Jack & Benny Lipson. Hosted by: Thomas Honeck. Lisa Chamberlain is a multi talented artist, singer songwriter. With a unique background of classical piano and love for pop and r&b music she connects with a large audience. Her music is honest and pure. Her goal is to encourage listeners that they are not alone and bring them hope. Robert Grashaw is a musical theater writer. Lauren Gundrum is a NYC-based lyricist/librettist, producer, and violinist. Lauren’s debut musical PharmaBro ran Off-Broadway in summer 2017 and was nominated for an Off-Broadway Alliance Award for Best New Musical of the 2017-2018 season. PharmaBro had a sold-out developmental run at The Workshop Theatre during the 2016 Midtown International Theatre Festival, and has been featured in Vanity Fair, Rolling Stone, The NY Post and The NY Times. Lauren was nominated for the MITF Outstanding Playwright Award, is a member of the Dramatist Guild, and a participant in the Advanced Class of the BMI-Lehman Engel Musical Theatre Workshop. She has held residencies with Players Theatre and the Apples & Oranges Theatre Accelerator. Lauren is a graduate of Duke University where she minored in music, focusing on violin performance. She began studying musical theatre writing through the Einhorn School of Performing Arts at Primary Stages. Brandon Lambert is a New York-based songwriter and actor. In 2017 Brandon and Gary S. Jaffe’s musical At First Sight was commissioned and produced by the Mountain Playhouse, and over the past few years Brandon has had five TYA shows commissioned and produced by Gretna Theatre. As an actor, he starred as Marcus on the national tour and then the Canadian premiere of Murder for Two, and has worked regionally at the Pittsburgh CLO, the Pittsburgh Public, and Flat Rock Playhouse. He is a member of the BMI Musical Theatre Workshop (Advanced, Harrington Award), the Dramatists Guild, and Actors’ Equity. Jack and Benny Lipson are Los Angeles-native twin composers, vocalists and multi-instrumentalists Jack and Benny Lipson united to birth the award-winning project jackbenny, which injects musical theater storytelling into the gamut of artistic styles. They shared their debut show in 2016 with musician-comedian Reggie Watts, and have since played their “sensational, clever and astute” originals in Los Angeles, New York, Chicago, Sheridan, Wyoming, where they presented their “musicalette,” Miranda, Please! through the Wyoming Theater Festival, and even in Falam, Myanmar. As the house band for Anita Procedure’s bimonthly Queer Cabaret, jackbenny has collaborated with artists including Darren Criss, Michael Arden, and Jai Rodriguez, and they play regularly with undie-rockers The Skivvies throughout the West Coast. jackbenny performs once a month in residency at the Lyric Hyperion Theater in Los Angeles and are developing Brainstorm, a 3-character song cycle of their music. Tickets available at: www.purplepass.com/works1021 Don’t miss out.